The idea of the döner kebab - a huge cylinder of spiced meat thinly sliced as it rotates in front of a hot grill - comes from Turkey originally. The meat is generally lamb or chicken, and in the UK it's served with salad in a split-open pitta bread and drizzled with garlic mayonnaise or a hot chilli sauce. If you want to make your own, so you know the actual meat that went into it, here's my recipe. The easiest way to do this is to use ready-minced lamb. Or you can use deboned chops or leg steaks and mince them yourself. Chop the meat into chunks that will fit through your mincer. Peel and finely chop the onion and garlic. Mix all the herbs and spices together with the meat, onion and garlic. If you are using a mincer, put the mixture through it using the fine plate, otherwise mix by hand until you have something like a paste. Preheat your oven to 180°C (356°F). Lay out a generous amount of aluminium foil on your worktop. Place half of the meat mixture across the centre of it. Lay a sharpening steel or wooden spoon handle across the top of the meat and place the rest of the meat over it. Press the meat together to form a fat sausage. Wrap the foil around it, rolling to get a uniform cylinder. Close up the end away from the steels handle or spoons bowl, remove the steel or wooden spoon and close up that end of the foil. Wrap the sausage 2 or 3 times in more foil. Place in the oven and cook until the internal temperature reaches 65°C (149°F), about an hour. When the meat is cooked, let it rest in the foil for about 20 minutes, then unwrap it. Insert your sharpening steel or wooden spoon handle into the hole you made earlier and hold the meat vertically. Brown the outside of the meat with a blowtorch. If you don't have a blowtorch, put the meat under a grill or broiler, turning frequently until it is evenly browned. 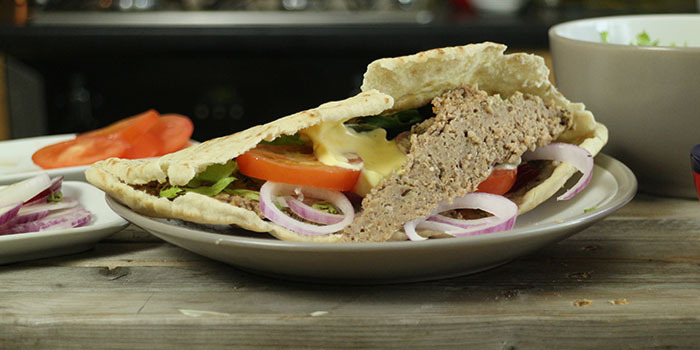 Slice slivers of meat from the outside and place into a pitta bread with salad. Serve with garlic mayonnaise or chilli sauce - or both. The video above is from the Keef Cooks YouTube channel. Click here to see the video recipe of Döner Kebab on YouTube. Prep time: 10 minutes. resting time: 20 minutes. Cooking time: 1 hour 10 minutes.